The videos of Planned Parenthood officials discussing dismembering human beings and harvesting (and possibly selling) their organs have been assailed as unfairly edited and, therefore, misrepresentative of what goes on there. Perhaps a far better representation of what is going on in Planned Parenthood was presented by Abby Johnson, a former Planned Parenthood abortion clinic director, when she testified before the Texas State Senate. Her testimony is not getting nearly the attention it deserves so I am posting it here. Thanks so much to Ryan Phunter who posted it on his blog, “Orthodox in the District,” which made it easily available to me to reblog here. After reading this testimony I cannot imagine how anyone can defend Planned Parenthood anymore. I hate to say that I am not surprised by any of these developments as they are all logical conclusions from the dehumanization that pervades our culture and as especially expressed in Planned Parenthood, an organization founded by a eugenicist, racist, and Nazi sympathizer (see here and here and here and here and here). Now, more than ever, the scourge of abortion needs to be stopped. God have mercy on us all. I just discovered this blog and I thought this post was really thought provoking as it made me look again at the founding of America but through a different perspective. It also has made me rethink my view of monarchy and take another, but this time more skeptical, look at what is essentially my perhaps ungrounded assumption that the republican/democracy system is obviously superior to the alternatives. 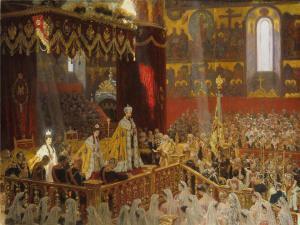 Laurits Tuxen’s 1898 Coronation Portrait of Nicholas II and Alexandra Feodorovna.